One of the most fundamental roles of any parent is as protector; keeping one's child safe and away from harm. It's not a role that diminishes or ends as they grow older either, though where once you could set up fire guards and stair gates, you learn to settle for yelling: "DON'T DO/ TOUCH/ EAT THAT!" at appropriate, and sometimes inappropriate, moments. But accidents happen. They do. One minute everything is everyday and the next, life is a disaster movie complete with slow motion effects. On Monday night the 13 year old had an accident. She was in the kitchen making a hot water bottle when she doused her right arm with the contents of a freshly boiled kettle. She stood hopping from one foot to another, waving her freshly burned forearm and mouthing incomprehensible squeaks of pain as The Man scooped her up and set to administering cold water. Having soaked the burn for nearly half an hour in cold water and wrapping her arm in clingfilm, we set off to A&E to get her thoroughly checked out by the professionals. By then it was nearly 11.30 at night. We didn't get home again until nearly five the next morning, the NHS being an unwieldy beast that moves slowly but does so with care and skill. And thankfully, the Teen will be fine. The Man's previous first aid training and quick reactions having saved her from much more damage. 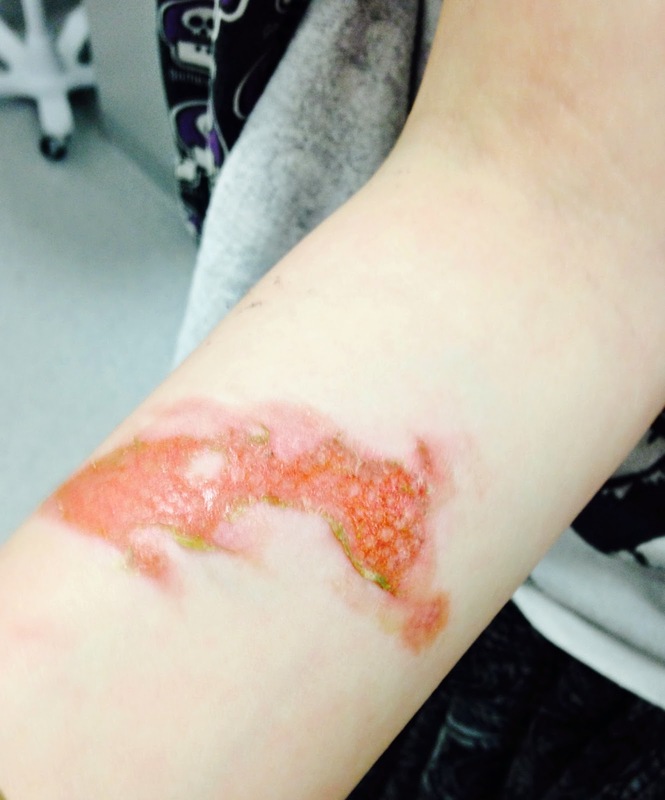 The Teen's burn is second degree and should heal cleanly and quickly leaving only a three inch scar that will hopefully fade over time. "If only," said one of the nurses in the Burns Unit around about 4am, "everyone reacted like you, we'd have less work to do." Less easy to recover from though is the aftermath, the frightening roll call of what if's and what could have beens scrolling through the mind in the small hours of the night. I can only be thankful that in a real live crisis, The Man kept his head and The Teen remained as calm as she did despite the shock she was in. Immediately apply cold water, cool and running rather than freezing, to the affected area for 20 minutes or so. If clothes have been covered in the hot liquid, remove them quickly and carefully or cut them away so they don't touch the skin. If fabric is stuck to the wound, don't try to move it at all, leave that to the professionals. Remove any jewellery from the affected area in case of swelling. Apply a sterile dressing or wrap in clean, trimmed clingfilm to protect the wound from infection, one of the major dangers of burn injuries. Don't apply ice or any lotions, oils, creams or butter to the burn. Don't break blisters or remove skin. Also don't put babies/ small children under cold running water for a full 20 minutes because there is a danger of hypothermia.